Suffield is a small village north of Aylsham. The War memorial is situated in the Churchyard. Private 23443. 9th Battalion,, Norfolk Regiment. Died of wounds Monday 5 March 1917. Age 20. Born Colby. Enlisted Cromer. 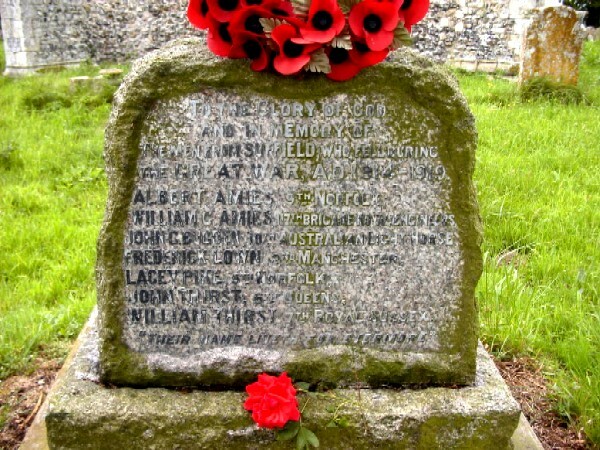 Son of Matthew and Anna Amies, of Suffield, Aylsham, Norfolk; brother of William below. Buried: BETHUNE TOWN CEMETERY, Pas de Calais, France. Ref. VI. B. 83. Pioneer 354231, 74th Div. Signal Company, Royal Engineers. 17th Brigade. Killed in action 26 September 1918. Age 27. Born Norfolk, enlisted Derby, resident Suffield. Son of Matthew and Anna A. Amies, of Suffield, Norwich, Norfolk; brother of Albert above. Formerly 99377, Royal Field Artillery. Buried: EPEHY WOOD FARM CEMETERY, EPEHY, Somme, France. Ref. III. H. 7. Private 53112. 2nd Battalion,, Manchester Regiment. Formerly 64597 Royal Fusiliers. Killed in action on Tuesday 14 May 1918. Age 28. Born Suffield. Lived Aylsham. Enlisted Norwich. Son of James and Elizabeth Lown, of Suffield, Norfolk. Buried: CABARET-ROUGE BRITISH CEMETERY, SOUCHEZ, Pas de Calais, France. Ref. VIII. P. 42. Private 2588. "A" Coy. 1st/5th Battalion,, Norfolk Regiment. Died Thursday 12 August 1915. Age 19. Enlisted Dereham. Son of Walter and Susannah Pike, of Church Farm Cottage, Antingham, North Walsham, Norfolk. Commemorated: HELLES MEMORIAL Turkey. Panel 42 to 44. Private 8095. 6th Battalion,, The Queen's (Royal West Surrey Regiment.) Killed in action Wednesday 4 April 1917. Age 20. Born and lived Suffield. Enlisted Norwich. Son of Mrs. A. Thirst, of Suffield, Aylsham, Norfolk. Buried: FAUBOURG D'AMIENS CEMETERY, ARRAS, Pas de Calais, France. Ref. III. N. 3. Private 9353. "B" Coy. 7th Battalion,, Royal Sussex Regiment. Died of wounds Friday 4 October 1918. Age 30. Born Suffield. Enlisted Cromer. Son of James and Mary Anne Thirst, of Suffield. Buried: SUFFIELD (ST. MARGARET) CHURCHYARD, Norfolk, United Kingdom.